Fun With Frisian: KLEAUWE - "split, cleave"
For the first lesson of the new year, let's take a look at Willem Schoorstra's 2011 novel, Rêdbâd - kronyk fan in kening (Redbad: The Chronicle of a King). This book is only available in Frisian currently. It is a historic novel written from the first-person point of view of a character named Hadagrim who is at the end of his life and who wants to set down King Redbad's deeds before he dies. The tale begins with the aged narrator catching glimpses of Odin's spirit approaching to return him to him forefathers. I am working through parts of the story slowly, as my Frisian is not exactly fluent yet. Ravens roppe in nije dei yn it ljocht; har skrille gjalpen kleauwe de slomme. In the light, ravens herald a new day; their alarming cries split the doze. Ravens looks just like what it means in English. However, it is said with a long "ah" as in father and a schwa. RAH-vuhns. Roppe means "to call" or "to cry." Say the first syllable like the English word "rope" and end with a schwa. ROHp-puh. Conveniently, nije was also discussed in the previous lesson. It means "new" and is said with the "igh" sound in "night." It takes a schwa on the end. NIGH-uh. You'll remember that dei rhymes with the English word "dye" and means "day." I think of the sunrise "dying" the morning clouds to remember this word. DIGH. Yn is Frisian for "in" and is said with the long "ee" in "seen." EEn. Ljocht means "light" and is said with the -y- glide followed by a long "oh," like in "road." The ch is the harsher consonant you hear in other languages like German, Russian, and Hebrew... the one that sounds a bit like someone clearing their throat. LYOHkht. Har is Frisian for "they" or "her." It's pronounced the way it looks, like the English word "hard" if you drop the final -d. Or like deep laughter... har, har! Skrille means "scary," "shivering with fright," or "alarming." Say it so that the first syllable rhymes with the English word "skill." The second syllable takes schwa. SKRIHL-luh. Gjalpen means "cries" or "screams." 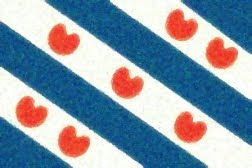 The Frisian -j- sounds like the English "y" gliding into a long "ah" sound. The second syllable, as is often the case, is said with a schwa. GYAHL-puhn. To the best of my current knowledge, kleauwe is said with the purse-lipped "o" with an umlaut over it that is found in German followed by an immediate schwa before the second syllable, a -w- gliding into a schwa. KLÖuhwuh. De is the word for "the" and is pronounced with a schwa. DUH. Finally, slomme is a noun meaning "slumber" or "doze." It is said with the long "oh" in "doze" and ends with a schwa. SLOHm-muh. The verb form is slomje, "to slumber."